I returned your call three seconds later, and you didn't answer. Society has trained us to lack patience. We're all entitled to everything and we all need it now. Amazon.com Prime arrives in two days, and we love it. It's the culmination of everything we need in society. I can get it fast. I don't have to work hard for it. Use the app, it's never more that an arm-length away. Order now. Don't wait. Don't think about the purchase. Of course you need those $80 shoes that won't actually fit. Really, you're harping on me for being a consumer and using a well-known, successful company? Don't get me wrong, I love it. Amazon.com really cashed in on our societal wants. They cater to our disfunction, and everyone else is now in a world where they need to catch up. Why go to the grocery store? Why go out in public? When I started getting nonperishables delivered to the house, my husband thought I had reached a whole new level of anti-social. Let's shift to another example of impatience. It happens to me most mornings. I come to a roundabout near the expressway and continue to be amazed. It says 'yield' not stop. What are you waiting for? Go home, life only gets harder from here! Of course, this is before Coffee Chaos calms my nerves and makes me a presentable human being. I have to wait a few extra seconds because the vehicle in front wants to let everyone in first. Whoa, whoa, you're going already? 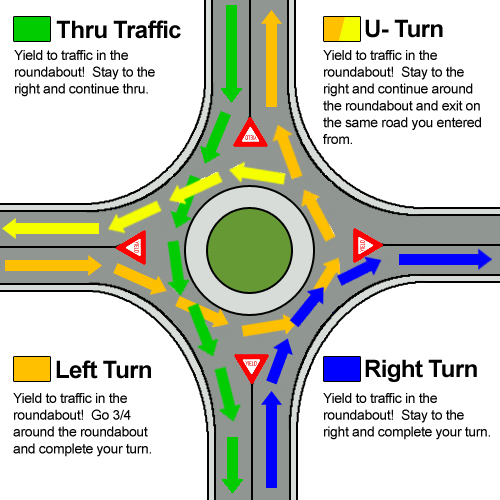 I think there is a car coming from Detroit that we should yield, I mean stop for too! The joy of how other people living their lives can make us so angry, so judgmental. Slow, cautious drivers must be imaginary smart. Online shoppers must be hermits who can't be bothered to see others. 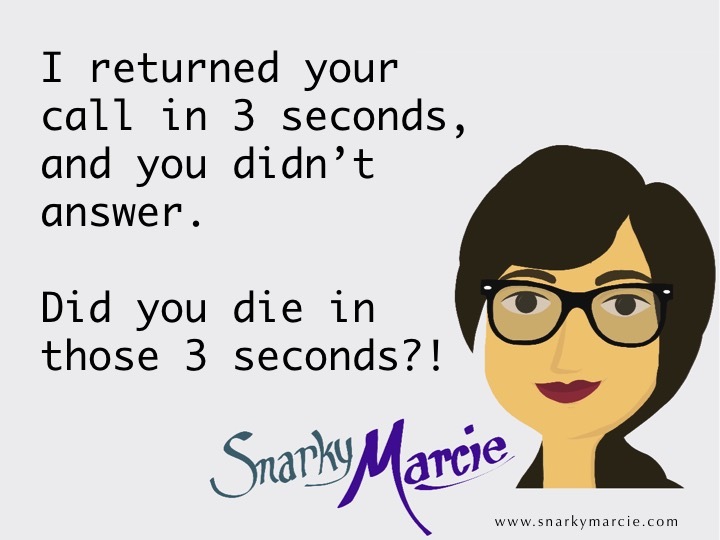 When we return a call in three seconds and they don't answer, they must be maliciously trying to ruin our day. 5. If you don't know them, don't worry. The lady in front of you at the gas station is fumbling through her purse. Papers fly. A few coins fall. Two tampons roll out. She's looking for her debit card. Get your life together. You're a mess. Whoa, do you know her? Did she ask for your opinion? Get over yourself, pick up the papers, coins, and tampons, and try to make her day a little better. #BeNice. 4. If someone didn't meet your expectations, consider their situation. Mr. Khaki, the FedEx guy gave you the wrong package. You needed those weight-loss pills today and now you won't fit into your dress this weekend. He's ruined everything. Like his job is even that hard. Maybe Mr. Khaki's mother-in-law is staying with him for a weekend that turned into a month. He's found 7 new gray hairs, and his wife keeps saying that WebMD gave her four days to live. Give the guy a break, he needs it. 3. Drink your coffee, and let it go. Before coffee, no talkee. You cannot be held responsible for the things in your head before caffeine and logic have been invited in. I get it. Drink it up, and let's pretend your judgmental rudeness never happened. 2. If you pray for patience, expect some opportunities for practice. Miracles happen, but prayer isn't a way around being a grownup. You need patience? We all do. Take every struggling moment as a chance to show others how strong you can be. You're at work and Mr. KnowItAll won't return your call. Have a little class and refrain from badmouthing him to everyone. You may get some sympathy the first time, but you'll quickly get labeled as a drama queen. Don't be a victim. #BeClassy. 1. 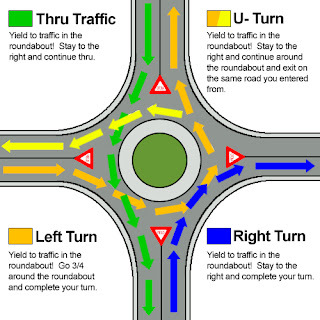 If you're the one that stops at roundabouts, here are some diagrams to help. You missed a post, didn't you? I warned you this could happen. Go subscribe now, and we'll pretend you did it right the first time.